Vertical bicycle storage racks provide space saving bicycle storage. The bicycle racks feature an extended loop that acts as a convenient point to easily secure both the bicycle wheel and frame with a single U-Lock. Designed for simple and easy installation, it is well suited to be mounted in the garage, basement, storage area or anywhere bicycle storage is needed. Available in both wall mount and freestanding models (wall mount racks pictured below). 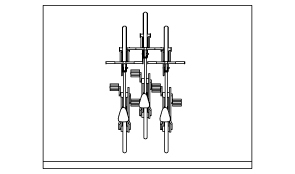 Freestanding models have four wall mount bicycle racks secured to a freestanding rack. The vertical wall mount bicycle rack is a popular choice for apartment/residential usage as multiple racks can be mounted in an alternating staggered pattern for maximum bicycle storage. The vertical freestanding racks hold 4 bicycles each and can be placed in rows for more bicycle storage space when a mounting wall is not available. The vertical bicycle rack is 28" deep, 3-1/4"Wide, and 28"High. 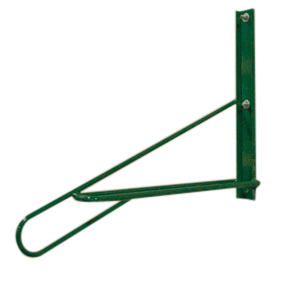 The rack is constructed of 1/2" O.D. solid steel rod and 5/8" x 2 1/2" steel channel. Available finishes include a galvanized finish or powder-coated color options displayed below.